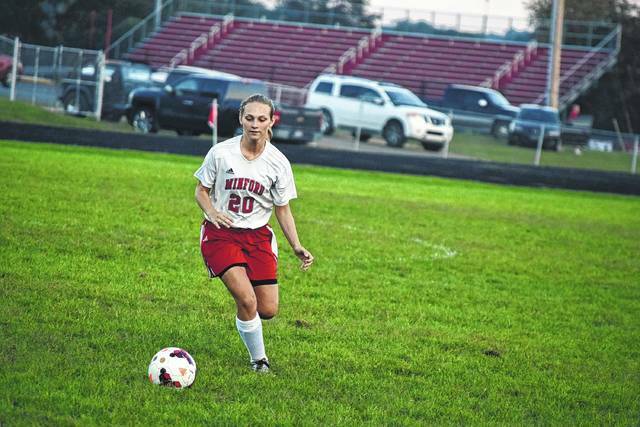 Minford’s Aspen Lambert runs upfield with the ball during a match against Northwest. Minford’s Emily Shoemaker (5) and Northwest’s Shannon Browning (27) fight for possession on Northwest’s end of the field on Thursday evening. MINFORD — In a multitude of different ways, Erin Daniels has proven herself as one of Minford’s finest multi-sport athletes. On Thursday evening, Daniels proved to have the winning attitude and overall talent that allowed the Falcons’ girls soccer program to prevail despite a strong effort from the Tim Amburgey-led Northwest Mohawks’ girls soccer program, with the senior’s goals in the seventh and 14th minutes of action in the opening half of play putting Minford ahead for good as the Lady Falcons emerged victorious with a 5-0 victory over the Lady Mohawks on Thursday evening on the Minford High School campus. For Shane Tieman, however, Minford, who improved to 7-3 on the year with the victory, could’ve played a better contest by advancing the ball on the outer halves of the field. As far as Amburgey was concerned, the match represented a vast improvement for Northwest, who fought hard despite missing six starters due to injury. The opening half of play, however, was all about Daniels’ ability to get up the field. The midfielder, who has already committed to play NCAA Division II basketball at Ashland University, slashed up the field for a nice shot in the seventh minute and followed by converting an excellent through ball from Ali Brumfield seven minutes later to obtain a 2-0 lead in the 14th tally. However, over the remaining 26 minutes of the first half, the Northwest defense stood tall and frustrated the talented and well-balanced offense. Behind the efforts of Ellie Curtis, Sydnie Jenkins, and Kaley Hamilton, the Mohawks didn’t allow Minford to obtain a clean shot on goal over the remainder of the half. However, while Northwest’s defense was playing an excellent brand of soccer, the Minford defensive unit responded with that same intensity necessary to maintain the early lead that it had established. Behind the play of Aspen Lambert — who Amburgey referred to as the best defender in the SOC II ranks — and Hannah Tolle, the Lady Mohawks were only able to cross midfield twice in the first half. 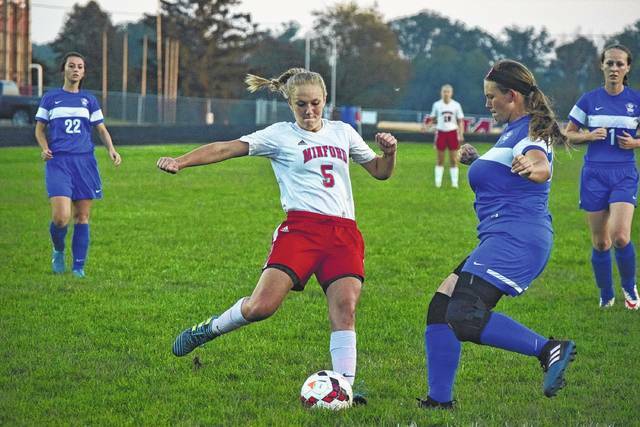 In the second half of play, Minford’s continued assault down the Northwest side of the field paid off as the Lady Falcons opened up distance between itself and the Lady Mohawks. Goals in the 45th and 46th minutes from Aurie Coriell (off of a corner kick) and Brumfield (from the middle of the box), along with a 62nd minute tally from Amy Shoemaker that bended nicely into the far side of the box, allowed the Lady Falcons to pull away en route to the 5-0 victory. With the win, Minford not only improved to the aforementioned 7-3 mark on the year but also improved to the right side of .500 in conference play (3-2). The Lady Falcons will travel to Wheelersburg next Tuesday for a 7 p.m. showdown in what will be a rematch from the pair’s first meeting on Aug. 31 — a 5-2 Wheelersburg victory. As for Northwest, Amburgey is hoping that the improvements that he has seen will start to translate to the win column. Northwest will play at West on Monday evening in what will be a 5:30 p.m. matchup.